Mercedes Benz has spent the last two years trying to figure out what the next generation A and B-class compacts should be. Traditional gas and diesels? Hybrids? EVs? A mixture of all of those? The stakes are high in the this segment of the automobile game and MB has a lot riding on it. And Merc’s parent, Daimler, has just announced that it is going to obligate €600 million in updates and expansion to the factory that builds the A and B-class compacts. 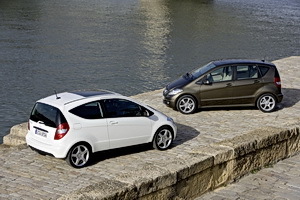 Mercedes has yet to announce which platform, whether the A- class or the B-class, it will use for the upcoming small cars, but we do know that they will start production at the Rastatt factory in late 2011. Mercedes is adding a 710,000 square foot body shop to produces the shells of the new models at the factory and they have already started construction of a new stamping facility in nearby Kuppenheim to produce the body panels that will be welded at the Rastatt body shop. In addition to the current hatchback body styles, the next-generation compacts will also add two new body configurations, although Mercedes is playing their cards close to their vest as far as details on the new models. The current speculation is that the most likely candidates are some sort of taller wagon/MPV sort of ride to contend against the likes of the VW Touran or Ford C-Max style of Euro-boxes (think a continental version of a Scion xB), or possibly a sedan. If it is a sedan, then the word has it that model will actually make it to the North American market. There has long been a desire for the current A-Class to be sold over here. It’s a car sort of like a Mercedes version of the latest Honda fit; sort of a mini, minivan, one box design. Mercedes produces them with a range of engines, and even had fuel cell demonstrators running around in Europe for a time. This, of course, had various green car enthusiast salivating at an American A-Class for some time, but to no avail, as of yet. The CEO of Daimler, Dieter Zetsche, also revealed that a low-volume production run of the battery electric A-Class, dubbed the A-Class E-Cell, would start late next year. There is speculation that Tesla, who is now in a technological partner shim with Daimler, will be supplying batteries or other components for the electric A-Class, but the California-based company would not confirm this.